Edna Terrill was born in Inola, Oklahoma on Dec 16, 1932 to John Froese and Agnes (Schierling) Froese. Edna attended school in Inola and Chouteau, and graduated from Chouteau High School in 1950. 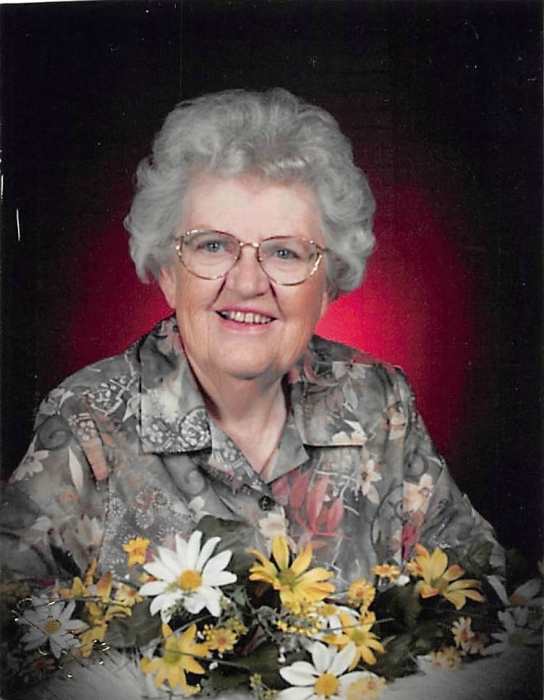 Edna attended Grace Bible Institute in Omaha Nebraska and Northeastern Oklahoma University in Talequah, graduating with a BS in Education from Northeastern in 1957. Edna married Jack Terrill of Barnsdall, Oklahoma in 1959. Jack was a Baptist minister and Edna was a faithful pastor’s wife, assisting as pianist, organist, Sunday School teacher and with many other activities. Together they ministered in Nara Visa, New Mexico; Flomot, Texas; Yoder, Wyoming; Des Moines, New Mexico; Springer, New Mexico; Cotton Center, Texas; and Thoreau, New Mexico. In most of these places, Edna was also an elementary school teacher, teaching all of the elementary grades at one time or another. After teaching for over 30 years, Edna retired from teaching in 1993 and continued to minister as pianist, organist, and Sunday School teacher, as well as assisting many in need in her community. Edna is survived by two children, Elizabeth Troncoso (Patrick) and Mark Terrill (Dine), seven grandchildren, Dyanna James (JaMarkus), Sara Zarate (Sergio), Dillon Troncoso, Israel Terrill (Aisha), Daniel Terrill, Abigail Terrill, and Bethel Terrill, as well as seven great grandchildren (Ayana Lloyd, Zavier Lloyd, Cameron James, Calie James, Jeremy Zarate, Jocelyn Zarate, and Jovani Zarate). Edna is also survived by her sisters Jane Sullivan (Johnny), Irma Froese, and Leona Hadwin, brother Wesley Froese (Gail) and sister-in-law Joyce Hurt (Joe) as well as many nieces and nephews. Edna is preceded in death by her husband Jack, father John Froese, mother Agnes Froese, and one grandson, Kyle. Funeral services will be held at 11:00 a.m., Saturday, March 23, 2019 in the Eden Mennonite Church in Inola, Oklahoma with Pastor David Wiens officiating. Visitation will be before the service from 9:00 a.m., until 11:00 a.m., Saturday, March 23, 2019. Burial will follow in the Barnsdall Cemetery with Israel Terrill, Daniel Terrill, Wesley Froese, Patrick Troncoso, Sergio Zarate, and Dillon Troncoso serving as casket bearers. To leave her family a message, please visit her Tribute Wall at www.shipmansfuneralhome.com. In lieu of flowers the family asks memorials be made to the (VOM) Voice of the Martyrs, 1815 SE Bison Road, Bartlesville, OK 74006. Arrangements are under the direction of Shipman’s Funeral & Cremation Service.